Image Styles Library is a graphic generation and image processing library for Win32 software developers. It contains "Image Styles" visual core which may be fully used in your programs for creating billions different backgrounds, textures, images and animations in realtime. 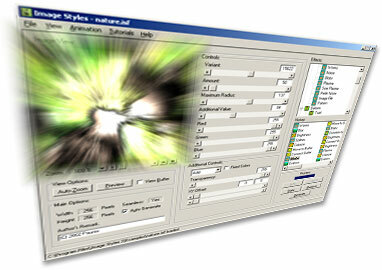 Also it may be used for creation of dynamically varied graphic filters and effects. Main features of the library are small file size, perfect quality and fast render speed. Very small Image Styles script file size (*.isf). The most complex files occupy about 500 bytes. Image resolution up to 30000x30000 without increasing file size. Now possible to use textures and images with big sizes! New method of image generation allows increase the render speed. All effects make wonderful results. Seamless and standart image generation algorithms. You may create textures and images in one time. Enormous amount of image variants. The library contains an unique technology of random image generation. You may freely use ISL in your freeware programs.